Sony Mobile Communications has launched “Made of Imagination”, a global advertising campaign introducing consumers to the first Xperia™ smartphones from Sony. The campaign marks Sony’s return to the smartphone market and emphasizes Sony’s connected entertainment experiences brought to life by Xperia smartphones. The campaign begins with a 60-second commercial directed by Wes Anderson. The concept will continue to be rolled out through 2012, using TV, print, digital, out-of-home and retail media. The print campaign reflects Sony’s connected entertainment experiences that enable consumers to Play, Watch, Listen, Create. Each concept is brought to life with unique imagery and real life models that were hand built to demonstrate what is inside the smartphone. 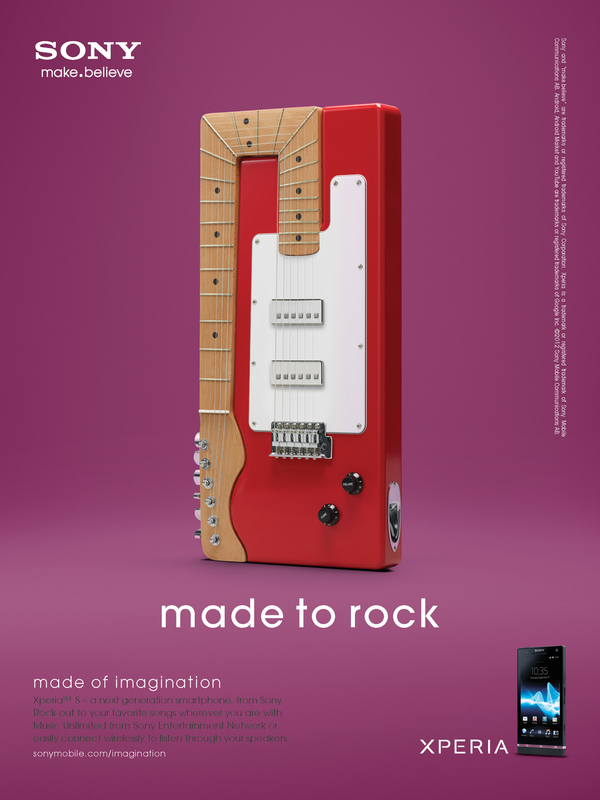 For example, for the ‘Listen’ concept the creative is a picture of guitar shaped like an Xperia smartphone. The Sony Xperia Made of Imagination campaign was developed at McCann New York by executive creative directors Thomas Murphy and Sean Bryan, creative directors Jason Schmall, Mat Bisher, art director Richard Kluver, copywriter Ryan Montanti, agency producer Greg Lotus, account director Pip Shepherd. Media was handled by McCann Worldgroup, PHD and LBi. Filming was shot by director Wes Anderson via Moxie Pictures with executive producers Dan Levinson, Lizzie Schwartz, head of production Roger Zorovich, producers Jeremy Dawson and Molly Cooper, and editor Andy Weislbum. Animation was produced at LAIKA/House by executive producer Lourri Hammack, director Mark Gustafson, producer Rebecca Bowen, production designer/art director Nelson Lowry, associate art director Julian Laverdiere. Sound designer was Craig Henighan. Sound engineer was Joe O’Connell at Blast. Music, by Jonsi, was supervised by Randall Poster. Print photographer was Carl Kleiner.